You are here: Home / Beauty Tips / Skin Care / Apple Cider Vinegar for Acne: How to use to for curing and scars? Apple Cider Vinegar for Acne: How to use to for curing and scars? Do you know the miraculous properties apple cider vinegar has for acne? It dates back to centuries that this “mother” of vinegar has been on use. It is a natural remedy and its healing properties can treat the toughest of acnes. It allows the skin to breathe properly by unclogging pores, removing oil and excess dirt and also preventing breakouts in the future. It’s a simple do- it- yourself (DIY) home formula and is remarkably effective for acnes. But let’s, at first, get into the basics. Apple cider vinegar (ACV) is essentially made from fermenting raw apple cider. You can find it in the market in the unpasteurised form to retain the probiotic benefits and to allow the yeasts and the bacteria to grow. The unfiltered, organic apple cider vinegar is the best deal to choose. Only these contain the grainy, muddy, substance that deposits as silts at the bottom of the container. This is the most beneficial way in treating acne scars. How to use apple cider vinegar for treating acne and the scars? The ACV can be used as a toner and is a hassle free homemade remedy. You can always do it yourself and doesn’t include the hassles of going to a parlour. Toners are the best part we love to do after washing our faces. To prepare the toner at your home, all you need to do is dilute 250ml of ACV to the same quantity of water and put it in a plastic bottle. Keep applying it to your skin twice a day and it is surely going to yield good results. You can also use green tea mixture. Green tea is filled with powerful anti oxidants and has myriad beneficial properties. Lemon brightens up your skin and helps your skin maintain the pH balance. To make this toner, you need to add 2/3 cup of green tea, and 3-4 drops of lemon juice. To this add, 1/3 of the apple cider vinegar. The face mask made from the apple cider vinegar is very soothing on your skin. It sloshes away the dead cells and actively works for cell renewal. Use apple cider vinegar for removing acne scars twice a week, to get a softer and a clearer skin. To prepare the mask, you need avocados. These are full in minerals, vitamins and amino acids. Take a half avocado and make it in a puree, add ½ tablespoon of honey and apple cider vinegar. Apply it your face and neck. After 15 minutes, wash it off with lukewarm water. Feel the difference yourself. To use it as a scrub, apply the same mixture as that of the mask. Just add 4 teaspoon of organic brown sugar. Scrub it on your skin, gently, and wash it after 15 minutes. All the dead cells would be done away with. And the brown sugar ingredient would leave you lingering with a nice sweet smell on your skin. Apple cider vinegar helps in detoxifying your body. It has anti-inflammation properties. Drinking apple cider vinegar is good for acne and is beneficial not only to your skin but to your health as well. It lowers the cholesterol level improves the glucose tolerance level and also the sensitivity to insulin. ACV contains lactic acid bacteria which help in rebalancing your gut flora, which reduces the redness and the inflammation of the acne, and can improve your minerals and vitamins deficiency. 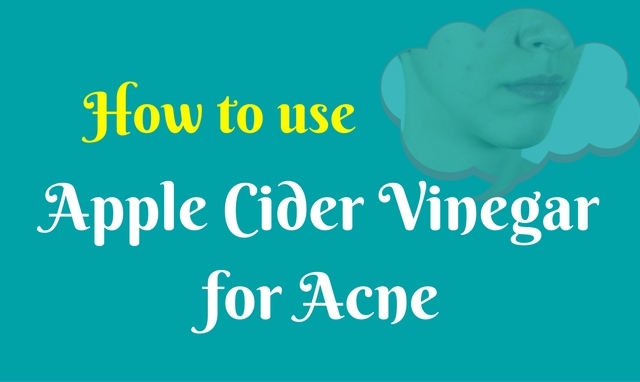 The process for making the apple cider vinegar for acne at your home is easy and quick. Take 2 tablespoon of apple cider vinegar and mix it with a teaspoon of raw honey. And start drinking it every day on a regular basis. You can also have another way of having it. In the filtered water, add the juice of one fresh lemon and one teaspoon of honey, and add 2 tablespoon of apple cider vinegar. ACV tastes really bad if taken straight from the bottle. Moreover, this vinegar may cause the stripping of your tooth enamel, because of its acetic nature. Hence, it is advisable to rinse your mouth after use. Our skin is naturally acidic and by our regular use of soaps and face-wash, we jeopardise the natural acidity that our skin has. ACV with its high acid content retains the acid mantle of our skin and protects our skin from the harmful rays of the sun, pollution. Apple cider vinegar works as a natural detoxifier and removes the harmful toxins that cause the acnes. Hence, it’s antiseptic and anti – bacteria capacity doesn’t let future breakouts. Never ever apply undiluted apple cider vinegar to your know. Its highly acidic content can have damaging effects on your skin. Hence, it is asked to dilute it with water. First, apply it in a small portion of your skin, and test it to see if it causes you any irritation. If it works fine on your skin, you are good to go. Avoid contact with your eyes. You might have a serious irritation because of its acetic nature, and if that happens, rinse it immediately. In the night, you can leave it overnight after properly cleansing your skin. With these few DIY skincare routines, you can get a clearer skin. Spare some time from your daily routines and indulge in some self – care. Flawless skin gives you confidence and using apple cider vinegar for treating acne scars is the easiest way to get one. It is a simple, easy to make formula at your home and gift your skin a rejuvenated, newer and a softer skin. And yes, always look for the unpasteurised apple cider vinegar for acne, to get the most effects from using it. Jaan , really u r great. Ur tips are helping me n lot to many who love themselves to be cared. ? I am really impressed with your Tips. Acne is a common skin inflammatory disease caused by sebaceous oil glands. When the hair follicles get clogged with oil, dirt and dead skin then acne can be formed. However when the acne does clear, it can leave scars that can be an annoying reminder. Apple cider vinegar is loaded with essential properties that make it as an excellent remedy for removing acne and its scars. You can use “Apple Cider Vinegar with Water” for Acne Scars. By reading your post i have very impressed. Actually Apple Cider Vinegar with Water is one of the best thing for protecting acne.This post will very helpful for acne affected people. Apple cider vinegar can be used as a cure for almost all types of skin problem like acne, scars, skin tag, warts and moles etc. Apple Cider Vinegar is an effective home remedy that contains many nutrients. These can improve your skin and treat skin problems naturally. Thanks for sharing.